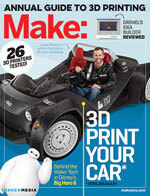 For more on the Strati 3D printed car, check out our cover story from Volume 42. The Detroit Auto Show is open to the public until January 25. If you’ve wanted to see the 3D printed car featured on the cover of Make: Volume 42, or even ride in it, now is your chance — Local Motors is displaying its Strati 3D printed cars on both floors of Cobo Center in downtown Detroit. The 3D printed body of the Strati is powered with an electric drive train from a Renault Twizy. If you’d like to take a ride in the first assembled Strati, stop by the lower level of Cobo Center. On the main show floor, Local Motors’ booth features the second Strati in a partially assembled state. They also have the CNC machine which was used to finish the body on display. A third body was inside the machine and is set to be assembled into a working Strati later this week. The booth also features a neat display of a possible production process. First, the base object is 3D printed as a rough design. Next, a CNC mill removes material from the 3D printed piece and levels the work piece. The work piece is then sanded, and finally the part is dipped in wax and polished. The resulting piece looks like a nicely polished fender. The material used to make the body is a blend of 80% ABS and 20% Carbon Fiber, and while the car body originally took 56 hours to print, they have reduced that to 44 hours. A different booth had a Makerbot Replicator that was printing a six-inch model of a car, which took about 12 hours. The Strati takes 12 hours to assemble into a working car.